Saree is an important attire when it comes to Indian women and is always in fashion. If you question a man asking what is his favorite attire when it comes to a woman, most of them will answer saree. Saree makes a woman look complete adding style, elegance and grace. Even bollywood actresses are no exception to this. Kareena Kapoor Khan is the most stylish actress in Bollywood currently and she can carry any outfit well. Kareena wears a mix of Indian and Western outfits and carries both effortlessly. She thinks a woman looks best in saree and her man Saif Ali Khan too loves to see her in a saree. 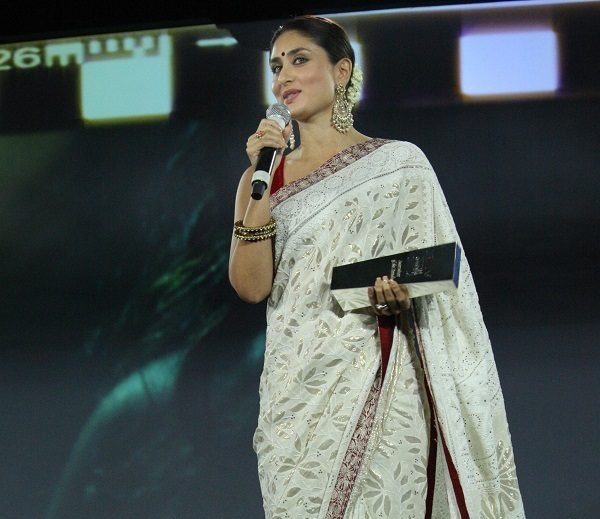 I personally love Kareena and her choice of sarees. I thought it would be a great idea to post the top ten looks of Kareena Kapoor Khan in saree and how wonderfully she carried it. Within few weeks of tying the knot with Saif Ali Khan, Kareena Kapoor was spotted attending the wedding reception of filmmaker Rohit Shetty's sister. She was looking stunning in her red saree and sindoor. Kareena was spotted in a white saree with red border and blouse when she attended the NDTV Indian Of The Year Awards in 2013. The saree was designed by Manish Malhotra and she looked gorgeous. The inaugural ceremony of FICCI Frames 2013 was graced by Kareena who looked absolutely beautiful in orange saree with yellow, navy blue and gold border. Kareena looks super hot in a see through black saree at Imran Khan's wedding reception. Who doesn't love a designer embroidery shimmer saree with mirror work? Kareena attended the Filmfare Awards 2012 in this shining saree from designer Manish Malhotra. When Kareena went at Madame Tussauds Wax Museum, she wore a lovely embroidered saree made of sequins, resham and patch work. The patched border added to the look of the saree. Kareena wore a green embellished saree when she attended Ritesh Deshmukh and Genelia's wedding reception. During the premiere of Saawariya, Kareena wore a stunning black transparent saree with red embroidery on the border. She looks super happy in this picture walking hand-in-hand with Saif. Doesn't she? This light green saree with pink and red embroidery on the border makes Kareena glow even more. This was during the 10th FICCI-FRAMES convention in Mumbai February 17, 2009. When Kareena was promoting 3 idiots movie, she wore a wonderful black Chanderi saree. She managed to look simple yet elegant. What is your favorite among the Top Ten Looks Of Kareena Kapoor Khan In Saree? My favorite will be the red one where she is spotted with sindoor as red is my favorite color. All designer sarees are wonderful and kareena kappor rocks in sarees.